Whenever I am working in a particular vein or train of thought foodwise, I tend to try to come up with as many riffs and variations as I can. Last year, I spent a few days experimenting with nanban sauce recipes, including coming up with an alcohol-free version that I'm quite proud of. (Classic nanban sauce always has alcohol in it.) After that, I had a ton of nanban sauce, and tried many ways of using it. 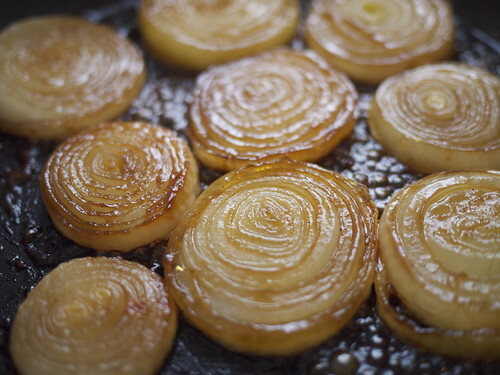 One such experiment that turned out well were these pan-glazed onions. They have since become a firm household favorite, but for some reason I haven't posted the recipe before. We just made a batch the other day, when I was reminded anew why I love this so much. It's salty, sweet and sour all at once. Interesting on its own, it's a rather eye-catching sidekick to a roast. It goes wonderfully with plain rice, so it's good as part of a Japanese meal too. It's also very nice instead of lettuce or raw onion slices on a roast pork or beef sandwich. Try it as a sandwich filling all on its own too, on a nice crusty loaf. 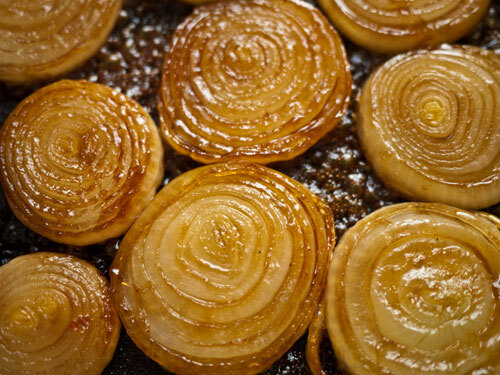 This is a very simple recipe, but you do need to be gentle with the onions to ensure they look their best. Regular yellow onions work best for this. Slice in half crosswise and cut out nice, even slices from the center parts, about 1/2 cm / 1/4 inch thick. I can usually get 2-3 slices out of one onion. Save the end bits of onion for other dishes. Pour a little oil into a large frying pan, then wipe around with a wadded up paper towel so that you just have a thin coating of oil. (You can use a non-stick cooking spray instead if you prefer.) Put the onion slice in a single layer in the pan, and turn the heat on to medium-low. (Note: if the heat is too high, the sauce will burn before the onions can get tender and sweet all the way through.) Pour the nanban sauce over the onions, tilting the pan a bit to distribute it evenly. The more sauce you add, the more intense the flavors will be. Cook with a tight fitting lid on for the first 3 to 4 minutes, then take the lid off. The liquid will slowly cook down. When the sauce has reduced by about half, take a peek under one onion slice by lifting it up with a spatula. It should look well on its way to becoming golden brown. Flip the onion slices over carefully with the spatula, and continue cooking until the liquid is getting sticky. Flip the onion slices over once more, rubbing them around the pan a bit until they pick up the residual sticky sauce. For show, serve good-looking side up, preferably in a single layer. Submitted by maki on 2011-10-13 11:29. Oh these look like art work! Beautiful. So appetizing, and timely. I bought tons of yellow onions at the market as it's the time of the year I make confit d'oignons preserves, but I'll change my idea of using one of the first batches to put on rice at lunch to try out your recipe instead. I might also try to flavour one of the batches of confit with nanban sauce (added right at the end, and caramelized for a few minutes). I bet that will be awesome too. With the bonito flakes that might not keep well the usual way, but the confits freeze well too. Tip: some of those confits d'oignons work really great to speed up japanese curries if their accent match curries (the one I make with cider, grated apple and maple syrup is the one I use most often for that (I add it either along the way during cooking, or mix it in the curry roux, and skip the grated apple and adjust the sugar content of the recipe. I plan to substitute a fruity dai ginjo sake for the cider this year). Using those onion preserves let you skip the long cooking of the onions each time, without comprosing on depth of taste. great combination of products, I bet this tastes great! Actuellement, nous étudions les papiers et quelques jours, nous avons exploré votre blog. Merci pour votre article, pour nous, il est très pratique. This looks delicious! It's worth noting- if you NEED this recipe to be vegan, you'll have to make your nanban without Worcestershire sauce in it, as that contains anchovies.